You are here: Home / Communication / Is Your Instant Messaging Application Really Secure? Any business-grade instant messaging application that you choose for your company replaces your emails and all other traditional mediums. It aims to take charge as the most reliable and secure means for interaction within your organization. Your instant messaging application helps your employees interact daily, share confidential documents and collaborate on critical issues/queries. Selecting the right messaging solution will ensure that your organization overcomes all communication hurdles and bring openness to your company culture. It’s important to note that while an instant messaging application is a must for your growing business needs, it takes just one wrong decision to make your company’s confidential data vulnerable and invite a potential security breach. We are not talking about any consumer grade instant messaging applications such as Whatsapp or Facebook, but business applications that cater to your organization’s needs. It is of utmost importance to select an instant messaging/collaboration application that is robust and secure on all fronts. Flashy, unwanted and unproductive features can definitely take a back seat when the overall security of your organization (and employees) is concerned. Yet many organizations get so caught up in the hype surrounding instant messaging applications that they overlook something basic : security and encryption. Slack is definitely a good product that has played its part well in creating a necessary revolution to help companies realize that emails are a tool of the past. But multiple Slack-related security breaches have made users aware that they need to be more careful while opting for major software such as a business instant messenger. There are also other Slack-like, me-too products such as Flock, Ryver, Fleep, Rocket Chat, etc. who have their work cut out for them. Their objective seems to make and advertise their products similar to Slack and stringent security measures and features do not appear to be the priority. Office Chat is an instant messaging application that emphasizes security and admin controls to help you secure your business communications. It is available on multiple platforms that include desktop (Windows & Mac), smartphones (Android & iOS) and web browsers. Office Chat ensures that the security aspects of instant messaging are primary features and not an afterthought. Office Chat delivers proactive security, control and IT compliance over your company’s data. Office Chat offers end to end encryption of messages and files. It means all messages exchanged and files shared on Office Chat are encrypted in transit (TLS/SSL) and at rest (256-bit AES encryption). It secures all of its web pages with 128-bit encryption using Secure Sockets Layer (SSL). This is an internet standard for securing sensitive data communication. In short, you never have to worry that something will go wrong in regards to security. Office Chat does all the hard work of safeguarding you, allowing you to focus solely on communicating in an efficient and productive manner. As Office Chat is 100% hosted of AWS, it benefits from following Key AWS Compliances and Certifications. Office Chat offers a HIPPA compliant plan that helps improve patient safety, satisfaction and service quality for healthcare teams and communication systems. Office Chat is both HIPAA and GDPR ready. Most security breaches happen because of weak passwords or shared passwords across systems. For security conscious companies, we recommend enabling 2 factor authentication for better security. If your employees only access Office Chat from your office, you can restrict access to your network and to your office IP-range. Allows you to set a time period of inactivity. After the set timeout period the user will be automatically logged out of the current session. User access log and security logs capture important account access and security-related events including suspicious access attempts by authorized or unauthorized sources. You can choose to receive security alerts for things like accesses to account from different geographic location, an incorrect number of password attempts by a user, unauthorized attempt to access from outside the valid IP range and more. End-to-end encryption of messages and files: All messages and files sent under the enterprise plan are encrypted when stored on the client, sent over the network or stored on the server. Many people who use an IM in their daily lives, both professional and personal, assume nothing bad will ever happen. But as a responsible business owner/organization, you must realize that security threats are getting worse and worse with each passing day. Depending on casual employee behavior, complacent security checks will eventually threaten your organization’s integrity. With this in mind, you can’t afford to sit back and hope there are no security threats in the future. It is important that you are proactive and take immediate action to protect your company (and your employees). 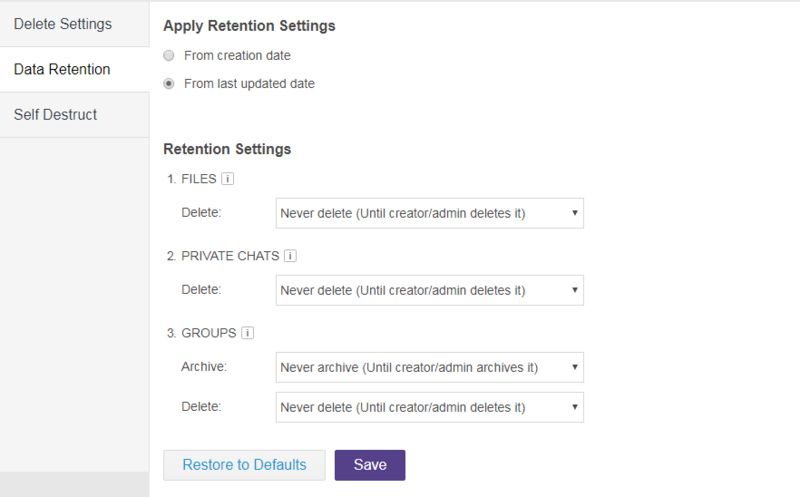 If you are not satisfied with the safety and security features provided by your current instant messenger or email, you should make a change today and evaluate Office Chat now. 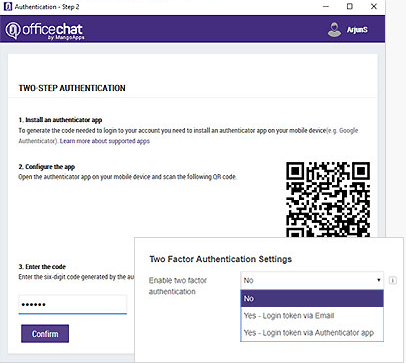 Once you have experienced a higher level of security with Office Chat, you will wonder what took you so long to make this move in the first place. Nothing beats the peace of mind you get with simple, secure communication!